Lian Li need almost no introduction, having burrowed into their particular niche in the PC case market so successfully. That niche, of course, is for luxury aluminium cases. For a not-insignificant sum of money you can get a nice brushed-aluminium-finish box with a modern, industrial look and a range of current features. 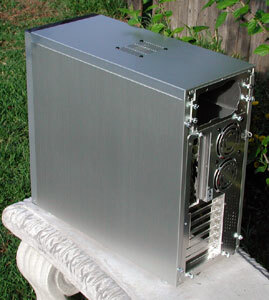 I haven't actually had a chance to look at a Lian Li case in detail before. I've seen a few around of course, but this is the first full review of one of their cases for me. 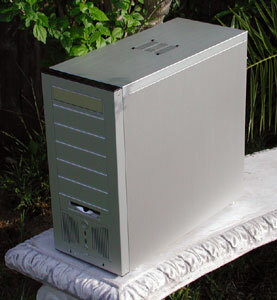 This particular unit is the PC-6077 and was kindly provided by Anyware, the Australian distributor. The first thing that caught my eye is the number of exposed 5.25" bays down the front of the case. For a mid-tower to have seven bays like this is virtually unheard of. For comparison, AOpen's venerable HX-08 and HQ-08 fulltowers, much larger than this unit, only have five bays exposed. Once we open the case up you'll see how this is accomplished. The tradeoff is that there are no exposed 3.5" bays - even the floppy drive sits in a 5.25" converter. I doubt many people are using more than one 3.5" device nowdays, so this isn't a big issue. Some fan-bus and other devices are designed for 3.5" bays (because they are an otherwise empty space in most cases). To use those in this case, you can remove the insert floppy-drive face in the 5.25 converter provided with the case. Then it's just a generic 5.25 to 3.5 converter for whatever device you want to use. Given that it seems Lian Li are assuming most people will have 5.25" devices, it's a little strange that they only provide one of their C-01 Faceplate Covers with this case. We reviewed one of these units separately here. They're great for getting rid of the "beige drive in aluminium case" effect, but we continue to wonder why Lian Li chose an ever so slightly different texture for the swivelling aluminium plate in the cover, compared to their cases and even the door surround on the faceplate cover. It looked slightly out of place on the separately reviewed one and this one is the same. You will need to purchase additional ones if you want to hide more than one drive of course. Also at the front of the case, at top and bottom, are some strips of fake carbon fibre. Their function is purely cosmetic of course and, while I'm normally annoyed by this kind of thing, they actually look pretty good in this instance. The top one breaks up the otherwise uniform look of the case and avoids the need for a hard aluminium edge. I guess nowadays we should just be thankful that they don't glow. 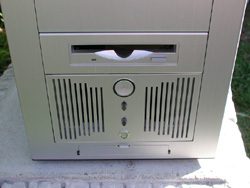 At the bottom of the case front is a block containing an 80mm intake fan with vents as well as the power and reset buttons. The power and HDD-activity LEDs are here too. The reset switch can be pressed with a determined pinkie finger but would be immune to accidental hits. 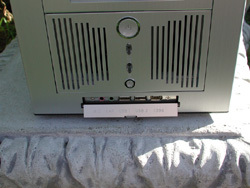 At the very bottom of this block is a small door, which opens to reveal plugs for microphone and headphones, two USB ports and a firewire or IEEE1394 plug. You connect these via provided cables inside the case to your motherboard, assuming it has the appropriate connectors. We'll see later that this whole block, occupying two 5.25" bays, can be moved to any two bays on the front of the case. If you prefer your intake fan and buttons at the top of the case, so be it. This is quite a nice feature which again, we'll look at in more detail when we open the case up. Looking at the rear of the case reveals nothing too unusual (apart from the photographer's shadow, silly me). There's thumbscrews holding everything together, which is a nice touch. 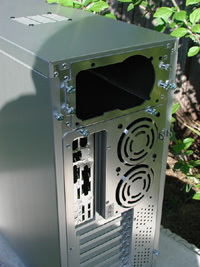 There are two 80mm fan mounts, one of which has a provided fan already mounted to exhaust hot air from around the CPU and video card area inside the case. This fan, like the other two provided in the case, is mounted with plastic standoffs lugs. The PSU area has a removable mounting plate and you can see that there's a removable motherboard tray - more on that later. 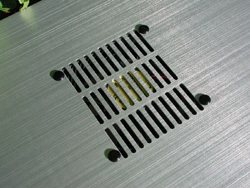 The final noteworthy external feature is the top-mounted exhaust fan or "blowhole" as they are commonly called. This is an excellent way to reduce in-case air temperature and it's great that Lian Li have saved you the trouble of hacking one into the lovely aluminium yourself. They even provide the 80mm fan, already mounted to blow hot air up and away. 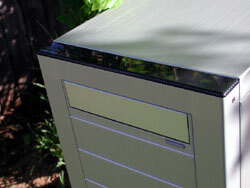 This picture also gives you a close-up look at the brushed aluminium finish of the case.